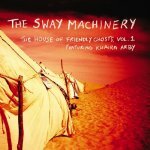 Brooklyn-based music collective Sway Machinery are playing a record release show on Saturday, March 6 at The Bell House for their new album The House of Friendly Ghosts, Volume 1 which comes out March 8 on JDub Records. This new record documents Sway Machinery’s journey to one of the most remote music festivals in the world, the Festival au Desert, in Timbuktu, Mali. The CD itself comes in a unique hardcover 80-page booklet, featuring lyrics, photos from Mali and essays on the project. Famous local artist and music aficionado, Jonathan Blum (art pictured below) is a long time fan of the band, so I asked him to say a few words about why you should come to the show on Saturday night. OK, In my personal opinion, this Sway Machinery concert will rock so good. That’s why I am ordering you all to come. They are just getting better and better. The last three times I’ve seen them have been some of my favorite concerts ever. They are playing with Khaira Arby, the amazing singer from Mali. OK, how about this; if the concert doesn’t blow your mind, I will pay you back, so there’s nothing to lose*. PS They were featured on All Things Considered last Sat. Check it out here. In addition to it being a record release show and the first show of their new tour, The Bell House gig is also a benefit for the Malian NGO ASSADEC. ASSADEC is a consortium of 300 women’s groups from small desert villages which provides AIDS information and instruction in the nomadic context. Having said that, if winning tickets to a benefit doesn’t make you feel guilty, I’ve got a pair of tickets to give away to one lucky reader. Fill out the contest entry form after the jump, winner will be notified tonight at around 6PM or so, locals only please. View the video for “Gawad Teriamou” and more Sway Machinery tour dates after the jump. * This was originally written as a letter intended for his friends, so as much I’m sure the show will be awesome, I don’t think you can hold Jonathan to this promise. 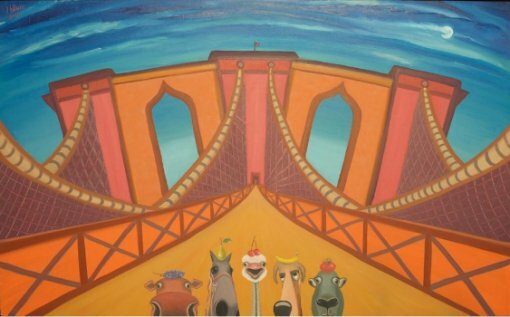 However, if you’d like to buy some art or meet the man in person, Jonathan’s studio is on 285 Fifth Ave (1st/2nd) in Park Slope.